Rough rice, also called paddy rice, is the whole rice grain with the hulls (about 20% of the grain) (Ffoulkes, 1998). It is a coarser product than brown rice, which is the rice grain without the hulls but still containing the bran, or polished rice, which is the rice without the bran. Paddy rice is much less used for animal feeding than other grains, as it is often more expensive and less available. Also, it tends to have a lower nutritional value due to its higher fibre content. However, the overall decline in per capita rice consumption, especially in the middle and high-income Asian countries like Korea and Japan, during the later decades of the 20th century has led to a renewed interest in the utilization of rice grain as a livestock feed. Cultivation of feed rice has been encouraged in the 2000s, for instance in Japan, where there are feed varieties of rice (e.g. Momiroman) (Maruyama et al., 2005; Inoue et al., 2012; Sittiya et al., 2011). Rice originates from Asia, where it has been cultivated since 6500 BC and is now naturalized in most tropical and subtropical regions. Rice grows from 53°N in China to 35°S in Australia. The optimal growing conditions are: an average day-temperature of 20-30°C, with a night temperature over 15°C; fertile, heavy soils; and a pH of 6.5-7. Most varieties ("swamp rice", "lowland rice") must be planted in stagnant water and require 200 mm rainfall/month or an equivalent amount from irrigation, whereas others ("mountain rice" or "upland rice") require less irrigation and 750 mm rainfall in a 3-4 months period and no dessication. Rough rice grains are very hard and abrasive and should be ground before they are used as animal feed, particularly for monogastric animals (Ffoulkes, 1998). 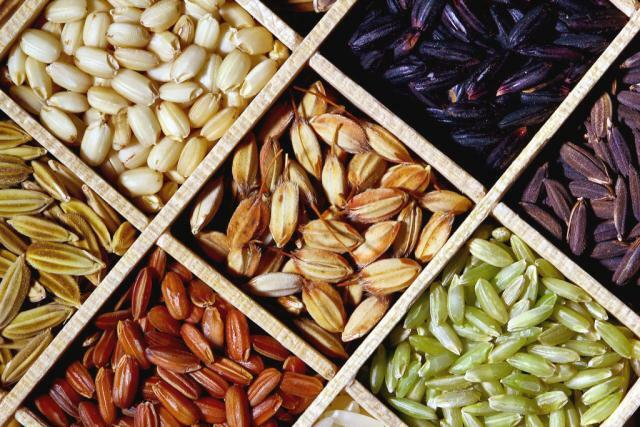 Forage rice grain is difficult to store in the same way as food rice because the drying process is not suitable for post-harvest storage, due to problems such as high cost and contamination of forage rice grain with food rice in rice processing facilities or country elevators. Ensiling has been proposed as a useful storage method since it does not require drying by heating. It was found that adding moisture, crushing, and adding lactic acid bacteria enhanced lactic acid fermentation, providing high fermentative quality in rice-grain silage. During a long storage period, not only lactic acid but also butyric acid and volatile basic nitrogen increased, however, a lactic acid bacteria additive can inhibit increases in butyric acid and volatile basic nitrogen (Inoue et al., 2012). Rough rice is relatively poor in protein (7-12% DM) but rich in starch (62-67% DM) so it is mainly used as an energy source. However, compared to other cereal grains, it is particularly rich in fibre (crude fibre 9-15% DM, lignin 5-6% DM) due to the presence of hulls, which tend to limits its use to ruminants or to fattening livestock. The presence of non-starch polysaccharides such as arabinoxylans and β-glucans may also be detrimental in monogastric diets. 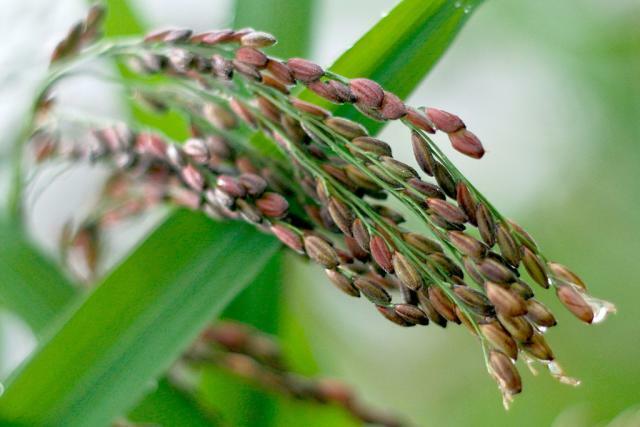 While rough rice does not contain antinutritional or toxic components, its high levels of poorly digestible and abrasive fibrous hulls may decrease animal performance, and cause digestive problems when fed ad libitum or at high levels. The feeding of mouldy rice should be avoided. 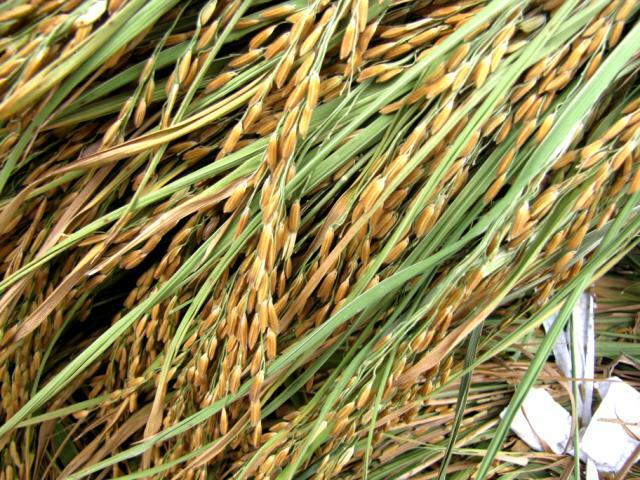 Paddy rice can be used as an energy source in ruminant diets, but due to its low protein content compared to other cereal grains an adequate supplement should be added to the diet. When paddy rice is to be used in place of maize grain or other cereal grains, it is recommended to ground it, either coarsely or finely, in order to increase its utilization. Ground rough rice is about 3 times more digestible in the rumen than unprocessed rough rice (Gadberry et al., 2007). In a comparison of physical treatments, the DM, protein and starch of unprocessed rough rice were found to be nearly undegradable. Crushing increased degradability, but grinding, and particularly steam-flaking, gave the highest degradability values, notably for starch: 88% effective starch degradability vs. 80% for ground paddy rice (Miyaji et al., 2010). The use of ensiled rough rice has been proposed in Japan (Maruyama et al., 2005; Inoue et al., 2012). An early study found that finely ground paddy rice could replace maize grain in the diet of fattening Hereford steers (275 kg), resulting in a live weight gain slightly reduced (812 vs. 962 g/d). It required 22% more concentrate and 32% more hay to achieve the same rate of gain (Weaver et al., 1937). Rough rice introduced as the sole cereal grain source in diets fed ad libitum to fattening steers for 4 months caused severe digestive disorders in some animals, with a marked decrease in intake and live weight during the last 2-3 weeks. The daily weight gain of steers fed whole paddy rice was lower compared to that obtained with crushed or dehulled rough rice (460 vs. 940 and 850 g/d respectively) and carcass characteristics were also inferior (Moran, 1973). Ungrounded rough rice replacing 50% of maize grain in the diet of fattening lambs (29 kg) resulted in the same live-weight gain (170 g/d) and carcass quality. However, when rough rice totally replaced maize grain, lambs had a lower daily weight gain (140 g/d) and consumed more alfalfa hay and concentrate per unit of growth (Weaver et al., 1937). Rough rice can be fed to pigs (Blair, 2007), but the presence of fibre and non-starch polysaccharides, such as arabinoxylans and β-glucans, is detrimental to feed conversion in pigs (Wang et al., 2008). An early comparison between rough rice and maize grain estimated the value of rough rice to be 73% of that of maize grain when it fully replaced maize, and 82% when it replaced 50% of maize, indicating that it could be best used to replace up to half of the maize in the diet (Weaver et al., 1937; Göhl, 1982). The use of enzymes in diets containing high amounts (72%) of rough rice improved daily gain (460 to 500 h/d) and feed conversion ratio (from 3.61 to 3.27) (Wang et al., 2008). In spite of the generally lower nutritional value of paddy rice for pigs, a 1999 survey of Chinese pig farms reported that it accounted for about 4% of the tonnage of ingredients used in pig diets, and up to 8.5% in small farms (30 slaughtered pigs per year or less). Rough rice was used in China for pig feeding more than any other grain except maize (36% of the tonnage) (Zhang XiaoHu et al., 2004). High prices for maize resulted in higher inclusion rates for young rice grain in South China, where rough rice can be 30% cheaper than maize (Wang et al., 2008). Rough rice can be fed to poultry though its use is limited by the presence of hulls and non-starch polysaccharides. Information about the use of rough rice in poultry is scarce. It is considered to be poorly palatable (El Boushy et al., 2000). In some countries, rough rice is part of the natural diet of scavenging chickens, as observed for instance in Sri Lanka, where it accounted for 7% of the diet (Gunaratne et al., 1993). Comparisons between rough rice and maize grain show a much lower nutritional value for rough rice: - 36% (AMEn 9.2 vs. 14.3 MJ/kg DM, Rajaguru et al., 1985); or -13% (AME 12.9 vs. 14.8 MJ/kg DM, Sittiya et al., 2011). For laying hens, rough rice gives good results when it constitutes 20-30% of the diet (Göhl, 1982). In Laos, in a trial with local chickens fed paper mulberry silage (Broussonetia papyrifera) ad libitum, supplementation with rough rice up to 25% LW increased growth rate, though the effect was the highest at the 5% inclusion rate (Sangkhom Inthapanya et al., 2010). In China, in ducks fed diets containing 20% rough rice (replacing 40% of maize grain), average daily gain and feed efficiency was slightly lower than for ducks fed the control diet (maize-soybean meal), but feed intake was unchanged. Treatment with an enzyme complex (xylanase, beta-glucanase and cellulase), improved performance, and increased the metabolizable energy of the diet as well as the protein and NDF digestibilities (Kang et al., 2013). Vietnam Crossbred males, 60 days 15 g/d supplementing sweet potato vines, water spinach or combinations of those with local forages (Hymenachne acutigluma and Wedelia spp). Water spinach and sweet potato vine associated with Hymenachne acutigluma or Wedelia spp. at the ratio of 1:1 and supplemented with rough rice increased economic return. Though similar in energy content to oats, rough rice is less palatable due to the presence of hulls and should not be fed at more than 20% of the diet (Ffoulkes, 1998). Rough rice has been investigated as a potential cost-effective supplement to increase the production of red swamp crawfish (Procambarus clarkii) in forage-based systems. While results were positive in simulated pond environments, a trial in conditions closer to commercial aquaculture found that supplementary feeding with rough rice reduced yield and generated a negative economic benefit, perhaps as a result of residual feed rendering the bait traps less effective (McClain et al., 2013).